I quite like some of the One Direction songs, but I am not what you could call a 1D fan by any means. X Factor Boy Bands aren't really my kind of thing, and yet there are some One Direction songs that I seem to know most of the words to, weirdly, and I'm not sure how. When I hear them on the radio, I find myself singing along, much to my surprise, especially to Kiss You and That's What Makes You Beautiful. I also quite like Story Of My Life, and the video to that song is really sweet, with the pictures of Liam, Harry, Niall, Louis and Zayn growing up. When Zayn Malik announced that he'd left One Direction, it was clearly for the best, because he said that he wasn't really enjoying all of the attention and the constant performing that was such a big part of the band's success. Therefore, I found it surprising that he has decided to pursue a solo career so soon, and I'm not on my own here by any means. Many people have expressed confusion, as it seemed like he wanted to take a step out of the limelight, rather than into the solo spotlight. And so when his new single 'Pillow Talk' was first played on the radio, I was ready to dismiss it as being overly commercial and aimed at his adoring One Direction fans. I will be the first to admit that I was wrong, it is actually quite good and for me, that is a pleasant surprise, although the lyrics are a bit unnecessarily sweary I feel. It has a gritty R&B vibe and his voice is clearly quite capable of sustaining a solo career, although I don't see him becoming the next Robbie Williams, I have to say. Of course, Pillow Talk (or is it Pillowtalk - all one word?) zoomed straight up the charts to take pride of place at the number one position in both the UK and the USA (Billboard Hot 100), but just for one week in the UK, being overtaken by Lukas Graham and his song '7 Years'. 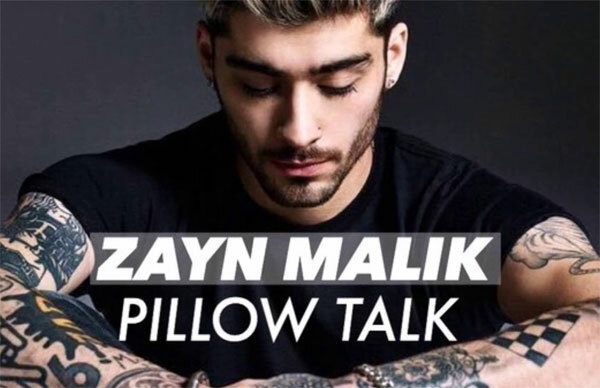 Zayn Malik's debut single Pillow Talk was taken from his upcoming solo album entitled 'Mine of Mine', which was released in March 2016. Other songs on the album include Befour, It's You, I Got Mine, Late Nights, My Ways, She, and Wrong.